It's Pep Rally week and we are here today to share a sampling of the NEW Paper Smooches March release with you! TWO new stamps and TEN new dies will be available to purchase on February 28th at 8:00pm pacific time. Once our release goes live, you will find our new products HERE. Deadline: You have until midnight PT on Sunday, March 1st to leave a comment. Please check the Paper Smooches blog on Monday, March 2nd to see if you are one of the FOUR lucky winners. Wanna take a look at my card? I used the new set of cloud dies and they go perfectly with the PS rainbow die! For my card, I created an inlaid die cut rainbow and then I reverse cut the clouds to make a shaker card. Love how you turned the clouds into shakers. Very clever. I Facebooked, Tweeted and Blogged about the hop so others can enjoy this too. A rainbow and a shaker card! What could be better?! love the acrylics in the clouds and i am a sucker for rainbows, bet there is a lot you can do with that set!!! This is simply ingenious! Cloud shaker's...Whoda thunk?? Love it! This is an amazing card! Love the shaker portion being in the clouds only. Always love a rainbow - and those clouds are sooooo cute! Love the rainbow and clouds, JJ. Cute card. Live the shaker cars! Well done! This is wonderful! Loving the shaker element! 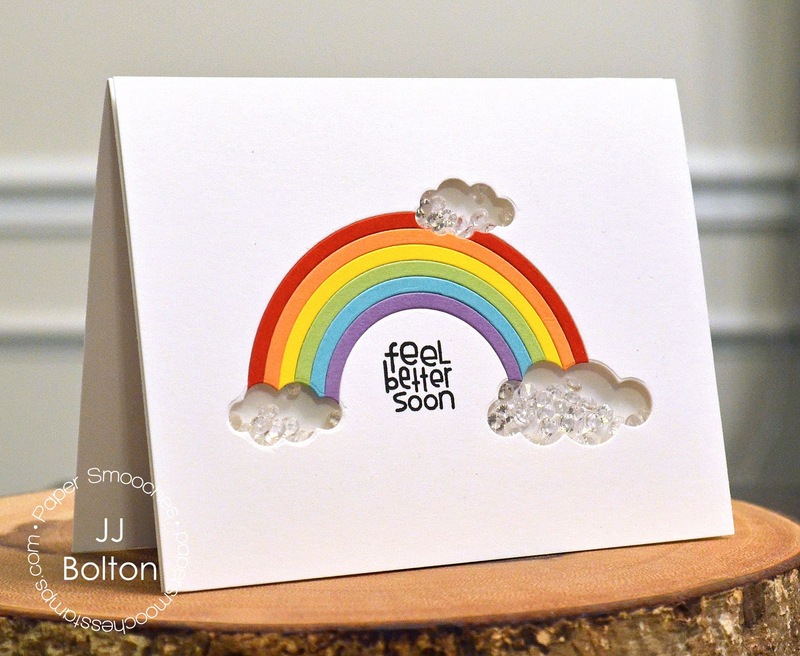 Love the rainbow and clouds....so so clever, your card is adorable. love the happy card but those shaker clouds are the bestest!!!! Be still my heart - love this shaker! Thanks for sharing. Gorgeous shaker clouds - love them. Cute card! Such a cute idea. I just love shaker cards and yours is so nice! ! another great shaker addition especially using the gems!! Super cute! The cloud dies are perfect. I love this card... its perfect combination of clouds and rainbow dies! Love how you used the clouds as shaker windows! This card would make me feel better. Love it. What a great way to add clouds to your rainbow. And your inlay design is perfect. Amazing shaker card!! Love it! That is the cutest card I have ever seen! I pinned it . . .
What a great idea to make the clouds as shaker! Really cute! This design is brilliant! What a fantastic shaker card. Thanks for the inspiration. Very colorful and sweet! Thanks! JJ, this is fantastic. Those shaker clouds are brilliant! I agree with the other comments, the shaker clouds are ingenious. Love them!! So clever! I think we all could use a bright bling rainbow in our lives! The cloud dies are perfect! This little cloud shakers are so cute. Great card. Fabulous card. Love the pretty rainbow and the clever shaker clouds!! The ultimate shaker card! this is DARLING! Most awesome shaker card--those clouds are dazzling! Love this, JJ! Love the fancy shaker clouds. Really cute card! This card is awesome!! What a great way to turn this into a shaker card! Great idea for the shaker in the clouds. I'm taking that idea and running with it. Cute card. Great idea and super cute card. Wow! Very creative shaker card with rainbow and clouds...love it!!! Very cheery and fun card, perfect for someone who is feeling under the weather. Love the shaker clouds, awesome! ingenious! the stones are perfect, sequins or glitter would not have had the same subtle bling effect. Great card! Love this shaker design, so cool!!! your shaker card is beautiful and so sweet! Love this card! The clouds being shakers is so much fun! very clever idea to end the rainbow with clouds! Love this idea! The card is so cheerful and striking! Thanks for sharing! Great card! I love that inlaid rainbow and then the clouds that you die cut to make a shaker card, awesome. Thanks for sharing. Rainbow shaker - so cute. Neat shaker idea! Good job! I LOVE rainbows .... so colorful and pretty. What a special card! Super cute card! Sure to brighten anyone's day! Sweet little shaker card. The cloud "filling" is awesome. Adorable rainbow shaker card!!! So happy and super fun! I can't wait for all the new goodies!!! What a great shaker card! Love the new release! Fabulous card! I love the way you did the shakers! Aloha, JJ! :) Love this card you shared in this BlogHop! It is so colorful and fun that anyone who received it would immediately be cheered up! I would love to see a video of you making this card. Is that possible? Thanks again for sharing your clever design! Very color card - like your sparkle too. I really like the bright colors on your card, and I LOVE that your top cloud took a "bite" out of the rainbow! And shaker cards are awesome, especially when they sparkle! that would make me feel better! Fabulous card - love the shaker clouds! FAB idea for a shaker card! Thx for the inspiration! What an adorable card. A rainbow shaker - it doesn't get any better. What a clever idea using the cloud die to make a shaker card. Just love this technique and how it came out. great card - you are a shaker card creative genius! your little clouds are so clever - I would have never thought to do that. Love it! lovely shaker card made! def love those rainbows! Love it! Esp. the 3 shaker clouds...what a great idea. shared blog hop on facebook! Love rainbow cards. I've got to get some of those crystals. Fantastic Shaker Card!! What a fun Rainbow and the little crystals are perfect! Thanks for the great inspiration! OMG the acrylic gems and that stunning rainbow are awesome! Such a clever idea to fill the die cut clouds, love it. What a clever shaker card! This rainbow goes perfect with this shaker clouds! Thank you for this happy happy hop! It's a hoppin' kind of a morning....there is something about rainbows and clouds..then make it into a shaker and BAM, pure perfection. Aww shaker clouds...would bring a smile to anyone's face. LOVE your shaker clouds!! So cute! Your little shaker clouds are so sweet- Love them used with the rainbow! This shaker card is sure to bring a smile! Love the cloud shakers! Great to cheer someone up! Recovering from food poisoning and it made me smile! Great card! I love the rainbow and those gems in the shaker clouds are perfect!!! Love the card. The shaker clouds are great. Thanks for sharing. Love the sweet shaker clouds! Ack! This is just too cute! I absolutely LOVE your shaker clouds! Oh my goodness - this is the coolest, cutest, most creative shaker card ever!!! Love the rainbow and love this whole card!!! You are marvelous!!! What a gorgeous rainbow shaker!! That would really make someone feel better!! Wow! That is sooo cute! Love how you used the clouds as the shaker. Awesome card. WOW. WOW. WOW!!!!!! This is awesome JJ!!! Your card is stunning! Super cute and colorful card! I love it! This is such a cute shaker card. Rainbows are among my favorite things, love this shaker card!!! Awesome card - so bright and pretty! Love how you made a "shaker" out of the clouds!! The inlay lock is so nice. Tweeted and Facebooked. This is a beautiful card, the gems are a perfect addition. Those shaker clouds are fantastic and I love the gems inside! Super cute card - love the rainbow and the CAS look. Cute card. Love that it is a shaker. Those sequins are perfect for clouds. Thanks. Your rainbow and shaker clouds are ADORABLE - LOVE IT ALL!!! THANK YOU for sharing your CUTE & CREATIVE INSPIRATION!!! Omg, such a cute card! 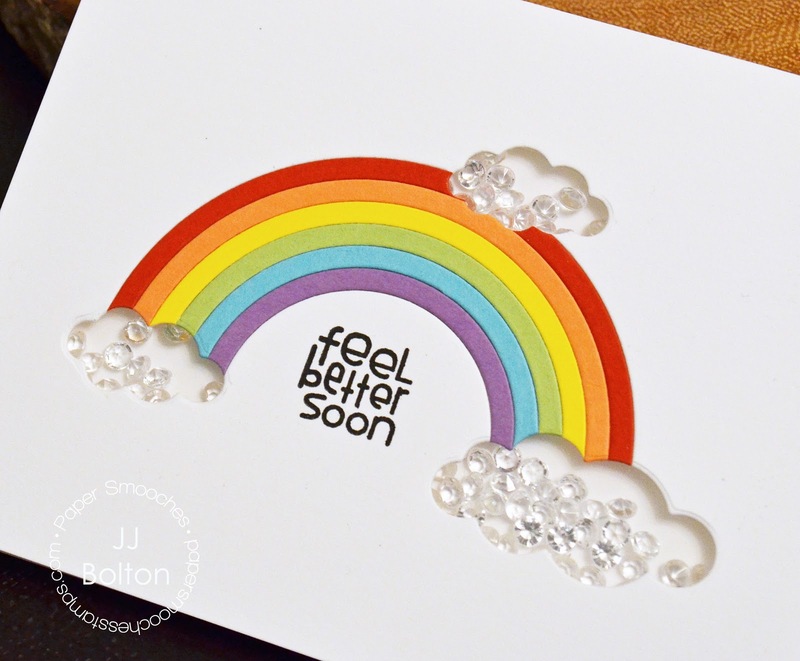 Love your rainbow card: the sparkly little gems in the clouds just make it extra special! !